Objective: Angiogenesis is essential for bone remodeling and regeneration. We previously showed that 3 months after transplantation of mesenchymal stem cells (MSCs) into a bone defect area, significantly more regenerated bone was present on the MSC side than on the control side. On the side transplanted with MSCs, the number of blood vessels was significantly higher. Therefore, during the remodeling process, MSCs, which are necessary for regenerating bone, were involved in bone regeneration through angiogenesis in the transplanted area. In addition, MSCs produce Vascular Endothelial Growth Factor (VEGF). Therefore, we investigated the influence of differentiation of MSCs on the expression of VEGF. Methods: We investigated how changes in osteogenic differentiation of MSCs affect VEGF gene and protein expression and how co-culture with Human Umbilical Vein Endothelial Cells (HUVECs) affects gene expression in MSCs. We also determined the role MSCs play in the transplanted area, and the effects on HUVEC morphology when co-cultured with MSCs. Results: VEGF gene and protein expression in undifferentiated MSCs was higher than in differentiated MSCs. VEGF gene expression in MSCs co-cultured with HUVECs was higher than when MSCs were cultured alone. In co-cultures of MSCs and HUVECs, a lumen-like structure was observed on the 3rd day of culture, and then several luminal structures were observed later. Conclusion: MSC transplantation may contribute to angiogenesis via production of VEGF. Mesenchymal stem cell, Vascular endothelial growth factor, Differentiation, Bone regeneration. Mesenchymal stem cells (MSCs) are undifferentiated cells that can be easily harvested and separated from bone marrow or adipose tissue. MSCs differentiate into not only osteoblasts, chondrocytes, and adipocytes but also into cells that are found in multiple human tissues and organs such as myocardium, liver, nerve, and vascular endothelial cells [1-3]. Therefore, MSCs have been the focus of attention in regenerative medicine. In the area of hematopoietic stem cell transplantation, promotion of engraftment and reconstruction of the hematopoietic system after transplantation of MSCs are expected due to the hematopoietic supporting ability of these cells . In our previous study, we cultured and transplanted MSCs and carbonated hydroxyapatite particles into a bone defect area and observed that early bone regeneration occurred in the presence of transplanted MSCs . Another study showed that when a tooth was moved to a site of bone that had been regenerated by MSCs and carbonated hydroxyapatite particle transplantation, the movement was the same as in normal bone . Thus, normal bone remodeling appears to occur in regenerated bone. Moreover, we also clarified that transplantation of MSCs significantly increases the number of blood vessels . MSCs play an important role in neovascularization. Guilherme reported that MSCs differentiate into smooth muscle cells and endothelial cells, resulting in increased vascularity and improved cardiac function in a canine chronic ischemia model . In ischemic animal models, MSCs may mediate neovascularization via paracrine signaling and have antiapoptotic, anti-inflammatory, and anti-fibrotic effects on cardiomyocytes and endothelial cells. Bone marrow MSC therapy may be better tolerated and more effective than therapy with bone marrow-derived mononuclear cells in terms of increasing lower limb perfusion and promoting foot ulcer healing in diabetic patients with critical limb ischemia . According to reports that examined the localization of MSCs after transplantation, MSCs decrease in number over time [9-11]. Leiker reported that 1.7% of MSCs transplanted into pig heart remained 2 w after transplantation . Only a small portion of injected MSCs (1%-2%) are present 1 w after transplantation, and the number of cells may decline further . Therefore, transplanted MSCs not only regenerate bone by differentiating into osteoblasts but also may have a paracrine effect through angiogenesis that occurs at an early stage. The most prominent stage of bone regeneration is angiogenesis, which is critical for most life processes prior to regeneration, tissue development, and repair. MSCs express high levels of Vascular Endothelial Growth Factor (VEGF) . Among VEGF isoforms, VEGF-A is the most important in angiogenesis . However, few studies have examined VEGF expression by MSCs in vitro. Vascular endothelial cells also develop into blood vessels, a process that involves complicated steps of elongation, branching, and lumen formation. Therefore, we speculate that MSCs may influence lumen formation by vascular endothelial cells. Thus, we examined interactions between MSCs and Human Umbilical Vein Endothelial Cells (HUVECs) in co-culture and the implications for angiogenesis. Human MSCs were isolated from pieces of iliac bone obtained during cleft palate surgery that were used as a secondary bone graft. All the procedures were approved by the Local Ethics Committee of the Hiroshima University Hospital (Decision no. 45). All donors provided informed consent. After removing the soft tissue including marrow, small bone chips were placed in a 100 mm cell culture dish (Corning, New York, NY, USA) containing α-minimum essential medium (α-MEM; Sigma Aldrich, St. Louis, MO, USA) supplemented with 10% fetal bovine serum (Daiichi Kagaku, Tokyo, Japan), 0.24 μl/ml kanamycin (Meiji Seika, Tokyo, Japan), 0.5 μl/ml penicillin (Sigma Aldrich), 1 mg/ml amphotericin B (ICN Biomedicals, Costa Mesa, CA, USA) at 37°C in 5% CO2. The medium was changed after 7 d. Within 2 w, cells migrated from the bone chips and adhered to the bottom of the cell culture dish. After several cell clusters were confirmed, MSCs were passaged and seeded at a density of 5 × 105 cells per 100 mm cell culture dish. Second passage cells were used in all experiments. A six-well dish (FALCON, Franklin Lakes, NJ, USA) was coated with type I collagen (Nihonham, Osaka, Japan), and 4.8 × 103 MSCs were seeded in each well and cultured for 7 d in α-MEM (Sigma Aldrich) at 37°C and 5% CO2. After reaching confluence, osteoblast differentiation was initiated with induction medium (osteogenic differentiation medium), which included 100 nM dexamethasone (Sigma Aldrich), 10 mM β- glycerophosphate (Tokyo Chemical Industry Co., Tokyo, Japan), and 0.2 mM ascorbic acid 2-phosphate (Sigma Aldrich) in α-MEM. Cells were cultured at 37°C in 5% CO2 for 20 d. To confirm calcification, cells were fixed in 4% paraformaldehyde solution (FUJIFILM Wako Pure Chemical Corporation, Osaka, Japan) and then stained with Alizarin Red-S solution (Kishida Chemical, Osaka, Japan). Total RNA was extracted from undifferentiated MSCs (Osteogenic differentiation (-)) and differentiation-induced MSCs (Osteogenic differentiation (+)) using TRIzol (Invitrogen, Carlsbad, CA, USA) and RNeasy® Mini Spin Columns (QIAGEN, Venlo, Netherlands). RNA integrity and concentration were evaluated with BioSpec-nano (Shimazu Corporation, Kyoto, Japan) with optic density obtained at 260 nm. Total RNA (1 μg) was reverse transcribed into cDNA using ReverTraAce (Touyoubou, Osaka, Japan) and Random primers (Touyoubou) according to the manufacturer’s protocol. Gene amplification of VEGF-A was performed on the LightCycler 480II (Roche Diagnostics, Basel, Switzerland) using the SYBR Green® Real-time PCR Master Mix (Toyobo). The primer sequences are shown in Table 1. Amplification conditions were 40 cycles of denaturation at 95°C for 15 s, annealing at 95°C for 30 s, and extension at 72°C for 10 s. The expression of each gene was normalized to the expression of GAPDH. Each sample was amplified in triplicate. Table 1. Sequences of PCR primers (human). Undifferentiated MSCs (Osteogenic differentiation (-)) and differentiation-induced MSCs (Osteogenic differentiation (+)) were washed with Phosphate-Buffered Saline (PBS), protease inhibitor (Sigma Aldrich) was added, and cells were collected into Triton X-buffer (Nacalai Tesque, Kyoto, Japan). Sample buffer for SDS electrophoresis was added to the obtained protein solution, and the sample was heated to 100°C for 3 min. After separation by electrophoresis on a 10% SDSpolyacrylamide gel e-PAGEL (ATTO, Tokyo, Japan), proteins were transferred onto a PVDF membrane using an iBlot gel transfer system (Invitrogen). The membrane was blocked with 3% milk at 25°C for 15 min (FUJIFILM Wako Pure Chemical Corporation). The membrane was incubated with primary antibodies at room temperature. Anti-VEGF antibody (ab1316, Abcam, Cambridge, UK, 1:1000) was incubated overnight, or monoclonal anti-β-actin (AC-15, Sigma Aldrich, 1:1000) was incubated for 2 h. Membranes were then washed three times for 5 min each with 15 ml PBS and 0.1% tween-20 before addition of secondary antibody conjugated to a fluorescent entity. Goat anti-mouse IRDye 800 CW (LI-COR bioscience, 1:1000) was incubated for 40 min at room temperature. Membranes were then washed twice with 15 ml PBS and 0.1% tween-20 and once with 15 ml PBS. Membranes were dried, visualized, and analysed on the Odyssey® IR imaging system (LI-COR). CellPlayerTM Angiogenesis HUVEC CytoLight Green cells (ESSEN bioscience, MI, USA) were purchased. Cells were grown in EBM-2 basal medium supplemented with the EGM-2 Single Quot kit (Lonza). For all experiments, HUVECs up to passage three were used. Cells were co-cultured in medium in a 1:1 ratio. VEGF-A gene expression was analysed as described above in monocultures and co-cultures after 1, 3, and 7 d.
To observe only HUVECs, these cells were preliminarily subjected to fluorescent staining with Calcein AM (excitation wavelength 490 nm, fluorescence wavelength 515 nm) (DOJINDO, Kumamoto, Japan) by incubating in Calcein AM at 37°C for 30 min, followed by two washes with PBS. HUVECs and MSCs were seeded on chamber slides (Iwaki, Tokyo, Japan) at 2.5 × 103 cells/chamber, and HUVECs alone were seeded on chamber slides at 5.0 × 103 cells/chamber. Cocultures of MSCs and HUVECs, HUVEC monocultures, and HUVECs treated with 40 ng/ml VEGF were observed with an inverted light microscope. After 2, 3, and 4 d, phase contrast and fluorescent micrographs were taken. Multiple comparison tests were performed with the Bonferroni/ Dunn method, and the comparative test between two groups was done with the Mann-Whitney U test. P-value<0.05 were considered statistically significant. Osteogenic differentiation of MSCs was assessed with Alizarin red staining after 20 d. The appearance of cells after 20 d in bone differentiation induction is shown in Figure 1A. Alizarin red staining in such cultures (Figure 1B) shows that calcification occurred. Figure 1: A. Morphology of MSCs 20 d after induction of bone differentiation. B. Alizarin red staining. Calcification has occurred. VEGF-A gene and protein expression was significantly decreased in cells that underwent osteogenic differentiation compared with undifferentiated MSCs (Figure 2A). As with qPCR, protein expression of VEGF-A was higher in undifferentiated MSCs compared with osteoblast-induced MSCs (Figure 2B). Figure 2: A. Comparison of VEGF-A expression levels in undifferentiated MSCs (Osteogenic differentiation (-)) and differentiation-induced MSCs (Osteogenic differentiation (+)) with qPCR. The gene expression level of VEGF-A was higher in osteogenic differentiation (-) than in osteogenic differentiation (+) (p<0.05). B. Comparison of VEGF-A protein expression levels in undifferentiated MSCs and differentiation-induced MSCs with Western blotting. As with qPCR, the expression level of VEGF-A was higher in osteogenic differentiation (-) than in osteogenic differentiation (+). 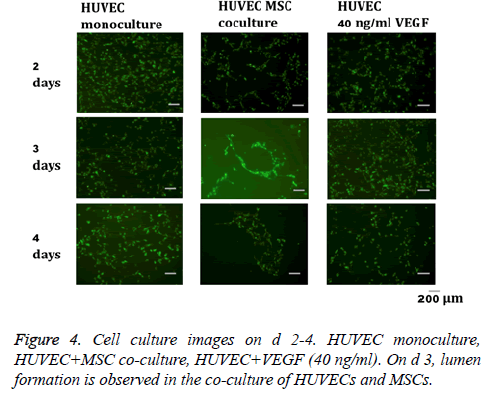 VEGF-A gene expression in MSCs co-cultured with HUVECs on the 3rd and 7th d after culture initiation was significantly enhanced compared with monoculture (Figure 3). 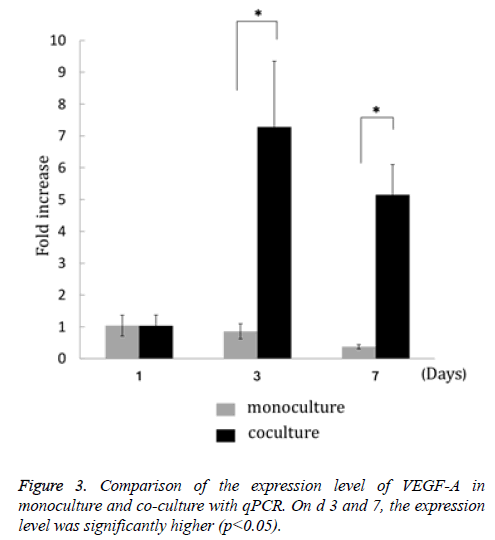 Figure 3: Comparison of the expression level of VEGF-A in monoculture and co-culture with qPCR. On d 3 and 7, the expression level was significantly higher (p<0.05). In the co-culture of MSCs and HUVECs, a lumen-like structure was observed on the 3rd d of culture. Subsequently, several luminal structures were observed on the 4th d (Figure 4). On the other hand, formation of lumen-like structures was not clearly observed in HUVECs treated with VEGF or monocultures of HUVECs. Figure 4: Cell culture images on d 2-4. HUVEC monoculture, HUVEC+MSC co-culture, HUVEC+VEGF (40 ng/ml). On d 3, lumen formation is observed in the co-culture of HUVECs and MSCs. MSCs are promising candidates for tissue engineering and regenerative medicine therapies. For example, MSC implantation induces therapeutic angiogenesis in a rat model of hind limb ischemia via VEGF production by MSCs [15,16]. MSC transplantation improves cardiac function in a rat model of dilated cardiomyopathy. These beneficial effects may not only involve MSC differentiation into cardiomyocytes and vascular cells, but also their ability to supply large amounts of angiogenic, antiapoptotic and mitogenic factors . Numerous studies have shown that MSCs migrate to and accumulate at the sites of tissue damage and inflammation , enhance engraftment of hematopoietic stem cells , and contribute to hematopoietic system reconstruction  and immunosuppressive function . MSCs have favorable effects on bone regeneration. Agata et al. reported that differentiated MSCs treated with Bone Morphogenetic Protein-2 (BMP-2) after fibroblast growth factor pre-treatment formed significantly more bone than undifferentiated MSCs treated with BMP-2 after fibroblast growth factor pre-treatment . Ikeda et al. showed that culturing MSCs in osteogenic medium containing rhBMP-2 with hydroxyapatite (HA) granules induces abundant ectopic mineralized tissue formation in mice, and that transplantation of undifferentiated MSCs does not induce ectopic ossification . Transplantation of MSCs during the growth period results in regeneration of significantly more bone than osteogenicinduced MSCs. Therefore, not only regeneration of bone tissue but also restructuring of bone while preserving normal bone metabolism is important for patients with conditions such as cleft lip palate, because their bone will develop during the growth phase after transplantation. To preserve normal bone metabolism, angiogenesis following creation of a vascular network is also required. 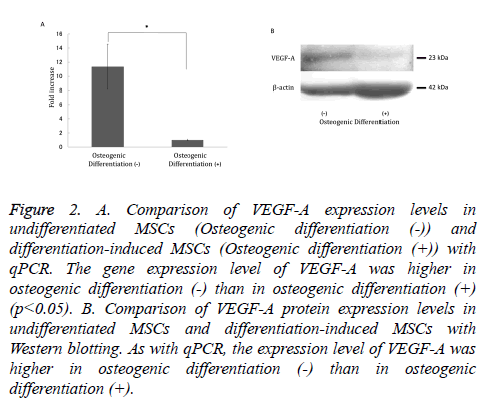 Our result showing significantly increased VEGF-A gene and protein expression in undifferentiated MSCs compared with differentiated MSCs suggested that undifferentiated MSCs are superior to differentiated MSCs for inducing angiogenesis and implies that MSC transplantation will be more useful than osteoblast transplantation in terms of normal bone remodeling. Aguirre  suggested that BM-EPC/MSC co-culture can induce the endothelial phenotype and angiogenesis in both cell types by direct cell contact, vesicle trafficking, paracrine signaling through up-regulation of growth factors, and synthesis of endothelial extracellular matrix and matrix remodeling proteins. Leszczynska  reported an increase in VEGF mRNA expression over time in direct co-culture of MSCs and HUVECs. This observation was similar to our present results. As a preliminary experiment, we conducted experiments on the change in the number of cells in HUVEC single cultures and co-cultures of HUVECs and MSCs. We found no significant difference in the number of proliferating cells. Therefore, a change in cell number does not seem to be an important factor. Co-culture of MSCs and HUVECs may increase the expression of VEGF via cell-cell contact between the two cell types. In general, HUVECs form a lumen after a few days of culture in the presence of growth factors on dishes coated with collagen or a fibrin clot. In this study, only GFP-labeled HUVECs were observed to form a lumen. This result suggested that MSCs have an important effect on formation of the lumen-like structure by HUVECs in the absence of extracellular matrix. Many reports have described co-culture of HUVECs and MSCs. Aguirre  reported decreased apoptosis of MSCs when directly or indirectly co-cultured with HUVECs compared to MSCs grown in monoculture. Wang  showed that the culture medium of MSCs promotes HUVEC proliferation and that the culture medium of HUVECs promotes MSC proliferation. Bidarra  reported that direct co-culture of HUVECs and MSCs results in formation of a tubular-like cellular network. Ikeda et al. showed that after 3-4 d in co-culture, HUVECs become elongated in shape, similar to HBDCs. Lumen-like structures formed by CD31-positive cells that were considered ECs only formed when HUVECs were co-cultured with HBDCs at a ratio of 1:4. In summary, our results suggest that undifferentiated MSCs, which produce more VEGF than osteogenic-induced MSCs, may contribute to angiogenesis. The authors state no conflicts of interest. This work was funded by grants from the JSPS KAKENHI (Nos. 15K20595, 17K17327, 16K20643, and 25893148). Dezawa M, Kanno H, Hoshino M. Specific induction of neuronal cells from bone marrow stromal cells and application for autologous transplantation. J Clin Invest 2004; 113: 1701-1710. Ikeda E, Yagi K, Kojima M. Multipotent cells from the human third molar: feasibility of cell-based therapy for liver disease. Differentiation 2008; 76: 495-505. Theise ND, Nimmakayalu M, Gardner R, Illei PB, Morgan G, Teperman L, Henegariu O, Krause DS. Liver from bone marrow in humans. Hepatology 2000; 32: 11-16. Pittenger MF, Mackay AM, Beck SC, Jaiswal RK, Douglas R, Mosca JD, Moorman MA, Simonetti DW, Craig S, Marshak DR. Multilineage potential of adult human mesenchymal stem cells. Science 1999; 284: 143-147. Yoshioka M, Tanimoto K, Tanne Y, Sumi K, Awada T, Oki N, Sugiyama M, Kato Y, Tanne K. Bone regeneration in artificial jaw cleft by use of carbonated hydroxyapatite particles and mesenchymal stem cells derived from iliac bone. Int J Dent 2012; 2012: 352510. Tanimoto K, Sumi K, Yoshioka M. Experimental tooth movement into new bone area regenerated by use of bone marrow-derived mesenchymal stem cells. Cleft Palate Craniofac J 2015; 52: 386-389. Silva GV, Litovsky S, Assad JA. Mesenchymal stem cells differentiate into an endothelial phenotype, enhance vascular density, and improve heart function in a canine chronic ischemia model. Circulation 2005; 111: 150-156. Lu D, Chen B, Liang Z. Comparison of bone marrow mesenchymal stem cells with bone marrow-derived mononuclear cells for treatment of diabetic critical limb ischemia and foot ulcer: a double-blind, randomized, controlled trial. Diabetes Res Clin Pract 2011; 92: 26-36. Oshima Y, Watanabe N, Matsuda K, Takai S, Kawata M, Kubo T. Behavior of transplanted bone marrow-derived GFP mesenchymal cells in osteochondral defect as a simulation of autologous transplantation. J Histochem Cytochem 2005; 53: 207-216. Leiker M, Suzuki G, Iyer VS, Canty JM, Lee T. Assessment of a nuclear affinity labeling method for tracking implanted mesenchymal stem cells. Cell Transpl 2008; 17: 911-922. Hasegawa N, Kawaguchi H, Hirachi A, Takeda K, Mizuno N, Nishimura M, Koike C, Tsuji K, Iba H, Kato Y, Kurihara H. Behavior of transplanted bone marrow-derived mesenchymal stem cells in periodontal defects. J Periodontol 2006; 77: 1003-1007. Pittenger M. Sleuthing the source of regeneration by MSCs. Cell Stem Cell 2009; 5: 8-10. Kagiwada H, Yashiki T, Ohshima A, Tadokoro M, Nagaya N, Ohgushi H. Human mesenchymal stem cells as a stable source of VEGF-producing cells. J Tissue Eng Regen Med 2008; 2: 184-189. Gerhardt H, Golding M, Fruttiger M, Ruhrberg C, Lundkvist A, Abramsson A, Jeltsch M, Mitchell C, Alitalo K, Shima D, Betsholtz C. VEGF guides angiogenic sprouting utilizing endothelial tip cell filopodia. J Cell Biol 2003; 161: 1163-1177. Al-Khaldi A, Al-Sabti H, Galipeau J, Lachapelle K. Therapeutic angiogenesis using autologous bone marrow stromal cells: improved blood flow in a chronic limb ischemia model. Ann Thorac Surg 2003; 75: 204-209. Al-Khaldi A, Eliopoulos N, Martineau D, Lejeune L, Lachapelle K, Galipeau J. Postnatal bone marrow stromal cells elicit a potent VEGF-dependent neoangiogenic response in vivo. Gene Ther 2003; 10: 621-629. Nagaya N, Kangawa K, Itoh T. Transplantation of mesenchymal stem cells improves cardiac function in a rat model of dilated cardiomyopathy. Circulation 2005; 112: 1128-1135. Le Blanc K, Samuelsson H, Gustafsson B, Remberger M, Sundberg B, Arvidson J, Ljungman P, Lonnies H, Nava S, Ringden O. Transplantation of mesenchymal stem cells to enhance engraftment of hematopoietic stem cells. Leukemia 2007; 21: 1733-1738. Zhang ZL, Tong J, Lu RN, Scutt AM, Goltzman D, Miao DS. Therapeutic potential of non-adherent BM-derived mesenchymal stem cells in tissue regeneration. Bone Marrow Transplant 2009; 43: 69-81. Ren G, Zhang L, Zhao X, Xu G, Zhang Y, Roberts AI, Zhao RC, Shi Y. Mesenchymal stem cell-mediated immunosuppression occurs via concerted action of chemokines and nitric oxide. Cell Stem Cell 2008; 2: 141-150. Agata H, Asahina I, Yamazaki Y, Uchida M, Shinohara Y, Honda MJ, Kagami H, Ueda M. Effective bone engineering with periosteum-derived cells. J Dent Res 2007; 86: 79-83. Ikeda H, Sumita Y, Ikeda M, Ikeda H, Okumura T, Sakai E, Nishimura M, Asahina I. Engineering bone formation from human dental pulp- and periodontal ligament-derived cells. Ann Biomed Eng 2011; 39: 26-34. Aguirre A, Planell JA, Engel E. Dynamics of bone marrow-derived endothelial progenitor cell/mesenchymal stem cell interaction in co-culture and its implications in angiogenesis. Biochem Biophys Res Commun 2010; 400: 284-291. Leszczynska J, Zyzynska-Granica B, Koziak K. Contribution of endothelial cells to human bone-derived cells expansion in coculture. Tissue Eng Part A 2013; 19: 393-402. Wang DS, Miura M, Demura H, Sato K. Anabolic effects of 1, 25-dihydroxyvitamin D3 on osteoblasts are enhanced by vascular endothelial growth factor produced by osteoblasts and by growth factors produced by endothelial cells. Endocrinology 1997; 138: 2953-2962. Bidarra SJ, Barrias CC, Barbosa MA, Soares R, Amédée J, Granja PL. Phenotypic and proliferative modulation of human mesenchymal stem cells via crosstalk with endothelial cells. Stem Cell Res 2011; 7: 186-197.